In Asia, mobile phones with NFC are already being used to purchase items (for example: retail items, vending machines, or bus fares) with transactions added to the user’s cell phone bill, or a credit card associated with the user’s account. But NFC hasn’t caught on yet in the US, mostly because retailers haven’t agreed on a standard. Yet. 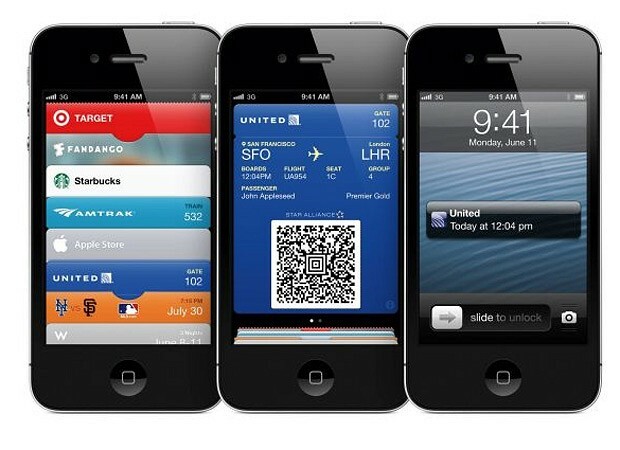 Above is an image showing a new feature that’s coming out on Apple iPhones this fall – it’s called PassBook. PassBook allows you to store tickets, loyalty cards, & membership cards of various types on your phone in one place, which can be scanned on the screen, or if your phone has NFC, waved over a sensor. This new feature will work with the new iPhone 5 being introduced with NFC in October, so get ready for it. Google Wallet has been around for Android phones for a while, but the ubiquity of the new iPhone will give this feature the necessary push to become a US standard. But this will become FAR BIGGER than mobile payments – NFC chips will be designed into appliances, furniture, even clothing, to communicate information to your mobile device in real time. Imagine your refrigerator telling your phone to add milk to your grocery list because your milk is going bad. Imagine trying out a recipe in your kitchen and your mobile device tells you what you do and do not already have in the pantry. Imagine your clothing alerting you of high blood pressure or low blood sugar. Yup! Convenience comes at a cost, of course. Location-based data is about to get even more rich for retailers – they will be able to track where you shop with finer detail than ever before. But this is already being done to a much greater extent that you know – you think the whole loyalty card system for groceries and retail doesn’t do data mining on your favorite shopping locations? It does. Trust me, marketing firms know about you. So get ready – NFC is coming in a big way. In the meantime, marvel at the accuracy of the 1993 AT&T “You Will” ad campaign, which features NFC / RFID tech at 2:00 – wow!